The motorcycle tire/tyre guide for all motorcyclists. 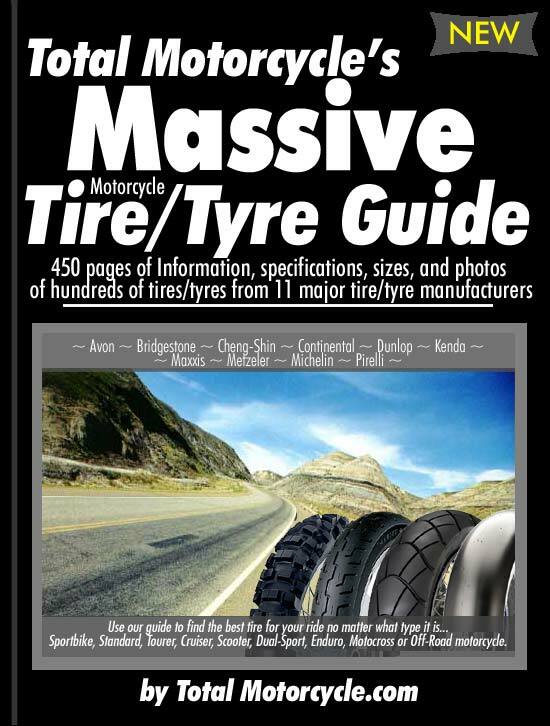 Total Motorcycle Website is pleased to present the Total Motorcycle Tire (tyre) Guide. Motorcycle tires, no matter what we type of bike we ride or where we love to ride it, we all need them. See all different types of tires/tyres from the major manufacturers all in one spot, right here on Total Motorcycle. Special thanks to: Avon, Bridgestone, Cheng-Shin, Continental, Dunlop, Kenda, Maxxis, Metzeler, Michelin and Pirelli worldwide. All images found in this guide copyright to the above holders.